Ibrahim Fahdi, M.D., (top right) who leads UAMS’ echocardiography lab, said the recent national accreditation underscores the sophisticated level of expertise provided to patients by the lab’s staff (above). 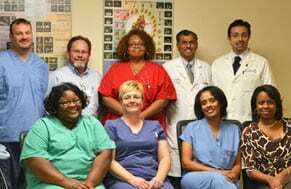 LITTLE ROCK – The University of Arkansas for Medical Sciences (UAMS) Medical Center recently became the only adult hospital in Arkansas to have its echocardiography service accredited by the Intersocietal Commission for the Accreditation of Echocardiography Laboratories (ICAEL). Adult transthoracic, which is a standard echocardiogram. The ultrasound probe or transducer is placed on the chest. Adult transesophageal, which is a semi-invasive procedure requiring sedation because the probe must be placed in the esophagus, closer to the heart for the best possible images. Adult stress test, which involves using a treadmill to create stress on the heart. It also includes a chemical stress test to evaluate the heart’s response to medication while being monitored via ultrasound. The accreditation effort was led by Ibrahim Fahdi, M.D., director of the UAMS Cardiac Noninvasive Laboratory and associate professor of medicine in the UAMS College of Medicine. Fahdi said the accreditation required additional training of the lab’s sonographers. It will include regular audits by the ICAEL and internal peer reviews of the imaging and cardiologists’ analyses of patients’ echocardiograms. Accreditation gives each of the echo lab’s 500-plus patients a month the assurance that their echo procedures are performed at the high standard that was set by ICAEL with the appropriate level of analysis. James D. Marsh M.D., who chairs the Department of Internal Medicine in the College of Medicine, said the accreditation is a great accomplishment for the Cardiac Noninvasive Laboratory. UAMS is the state’s only comprehensive academic health center, with colleges of Medicine, Nursing, Pharmacy, Health Related Professions and Public Health; a graduate school; a hospital; a statewide network of regional centers; and seven institutes: the Winthrop P. Rockefeller Cancer Institute, the Jackson T. Stephens Spine & Neurosciences Institute, the Myeloma Institute for Research and Therapy, the Harvey & Bernice Jones Eye Institute, the Psychiatric Research Institute, the Donald W. Reynolds Institute on Aging and the Translational Research Institute. Named best Little Rock metropolitan area hospital by U.S. News & World Report, it is the only adult Level 1 trauma center in the state. UAMS has more than 2,800 students and 775 medical residents. It is the state’s largest public employer with more than 10,000 employees, including about 1,000 physicians who provide medical care to patients at UAMS, Arkansas Children’s Hospital, the VA Medical Center and UAMS’ Area Health Education Centers throughout the state. Visit www.uams.edu or uamshealth.com.